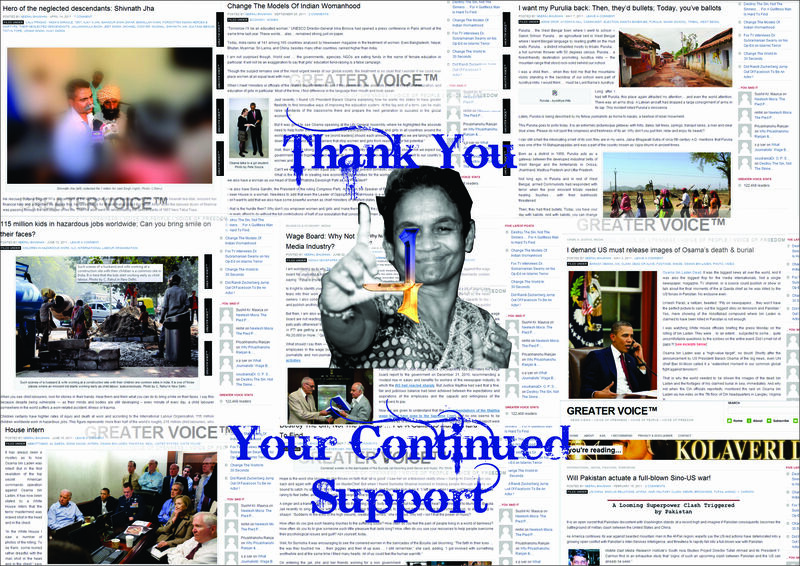 ‘Greater Voice’ completes four years today. Whose voice is this! Yours or mine… can’t be said, really. May be it speaks our language. It raises our voice. Admittedly, though, our voice is yet to reach the deaf-n-dumb. But … who knows … the answer, my friend is blowing in the wind, may be. ‘Greater Voice’ does not believe in handout journalism. Rather it acts like a bold human rights activist & a fearless story teller… applying, at the same time, editorial judgment & attention to details. Hopefully, it would connect with more people in the days ahead as its attempts to flush out the corruption, waste, pollution, terrorism, vulgarity & anarchy that flourish in our society. For many, India may be shining. But for that to happen, ‘Greater Voice’ believes, India must rise… you must rise, first. As a creature of the god, you also have the right of earth and heaven on land to live and breath. I am glad your greater voice is sailing against all odds and tides. I am sure one day your great voice would be heard everywhere. Best Wishes.